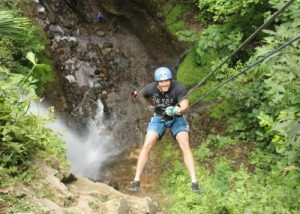 Looking for an amazing, heart-pounding Costa Rica adventure? We’ve got you covered! 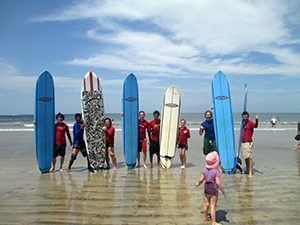 If you’re looking for kayaking, whitewater rafting, surfing, ziplining, and more, this is the adventure vacation package for you! We’ve created a tour full of activity with a dash of relaxation. Today you’ll arrive at Juan Santamaria International Airport in San Jose where your friendly Green Frog Adventures Guide will be waiting to transport you to your first exotic destination. Turrialba is a sleepy little mountain town located on the slopes of a now semi-dormant, 10,000-foot volcano, Volcan Turrialba. 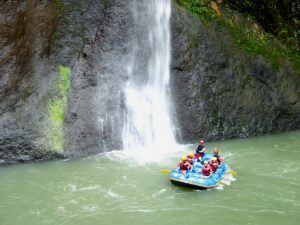 Turrialba is also known as the whitewater rafting center of the country. 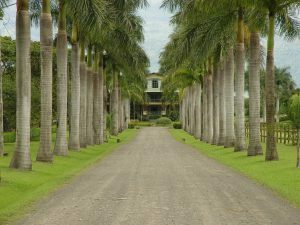 Once we arrive, we’ll settle into our plush, plantation-style hotel located on the shores of its own private lake. Get a good night’s sleep, tomorrow we start the adventure!! Today we’ll take a short drive through the sugar cane and coffee fields to the headwaters of the Pejibaye River. This blue-green mountain jewel is a stunning introduction to Costa Rican kayaking. In one of the many pristine pools your professional, bilingual guide will teach you the basics of kayaking, including the Eskimo roll. This is one-on-one instruction and only when you feel 100% comfortable with the kayak will we head on down the river. If you don’t like the hard shell kayaks you can take one of the inflatable kayaks known as duckies. We’ll stop halfway down on one of the many white sand beaches for a hearty lunch before we finish off the run. The river eventually runs into your hotel’s lake so we’ll arrive just in time for dinner and drinks by the pool. Wake early for a two-day whitewater rafting adventure on the Rio Pacuare. 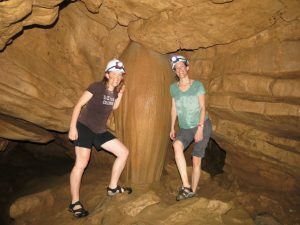 We will travel form Turrialba to Tres Equis where we descend through dense jungle into the heart of the Rio Pacuare gorge. This is a special river running through some of the last remaining virgin rainforest in Central America. 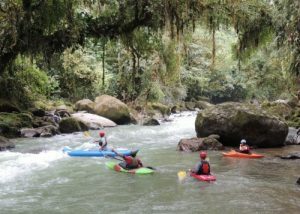 National Geographic called the Pacuare one of the top three commercial rafting runs in the world. 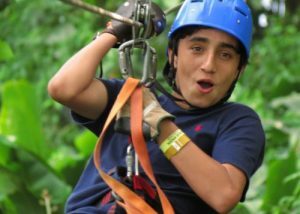 Between the class III and class IV rapids, enjoy side hikes to beautiful waterfalls and look for sloths, monkeys, and toucans in the jungle around you. Halfway down the river we’ll pull over at the famous Pacuare River Lodge, our stunning riverside abode for the evening. Sip on a tropical drink or explore the surrounding wilderness while your guides prepare a delicious jungle meal in the fully equipped open-air kitchen. Sleep under the stars or in one of the enclosed cabinas, but sleep well because tomorrow’s white water is even bigger than today’s! Today you’ll wake to the singing of tropical birds and rumble of the nearby river. The lovely aroma of percolating coffee will coax you out of your cozy cabinas and to the hearty breakfast your trusty guides have been preparing. Then, after breakfast, it’s back to work, we’ve got boats to load and rapids to conquer. Today’s whitewater will be even more thrilling than the previous day’s and we’ll encounter several exciting class IV rapids. From the take-out, we’ll take the short drive to the Caribbean coast and one of Costa Rica’s most beautiful beaches, Puerto Viejo. Puerto Viejo has gentle consistent waves that are perfect for the fledgling surfer. Surfing Today is yours to put the skills you gained the previous day to the test. Hit the waves for as long as you are able and then settle into a lovely cocktail and perhaps a night on the town. 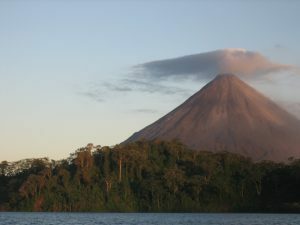 Today we’ll start making our way to the bustling mountain town of La Fortuna and Costa Rica’s most active volcano, Volcan Arenal. Once we arrive, you can spend the rest of the afternoon/evening soaking your worries away in the thermal hotsprings located at the base of the volcano. 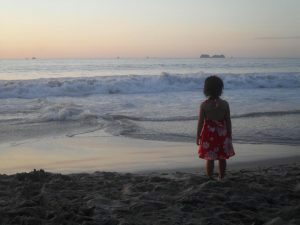 Today we’ll start making our way to the Pacific Costa and one of Costa Rica’s best surfing beaches. 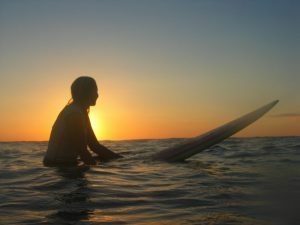 We’ll get an early start so that there will be time to hit the waves before nightfall. That evening enjoy a delicious dinner and on of Costa Rica’s legendary sunsets. Today we’ll start making our way up into the rugged mountains overlooking the Pacific to our next exciting adventure. Our final destination is the top of a stunning canyon that careens thousands of feet to the sea. 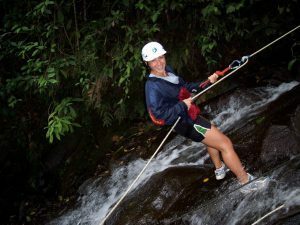 We’ll start our descent with a 150-foot waterfall and continue down by a combination of hiking, repelling, and swimming to our camp for the evening. The semi-permanent campsite is located deep in the canyon and behind a set of beautiful waterfall. Once we arrive at camp, just relax and take in the amazing scenery and enjoy a delicious dinner prepared by your trusty guides. Today, after a hearty breakfast, we’ll resume our wild descent down the canyon to the coast. We got a lot more repels and a ton of amazing scenery. We should arrive in time for another afternoon frolicking in the warm Pacific waters. That evening, enjoy a well-deserved tropical cocktail as you delight in your last day in paradise. Sleep in, after those last several days you’ve earned it! 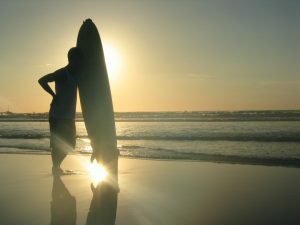 And, for those of you not able to sit still, try out the stellar waves that Dominical is famous for – surf’s definitely up! !